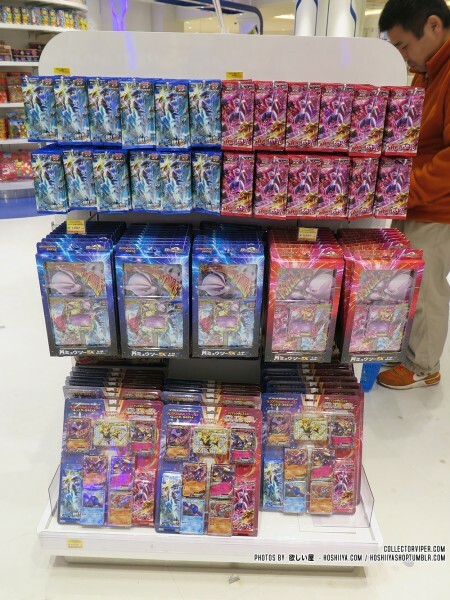 The time sure flies between set releases -- it feels like only a few days ago we were all bemoaning having to collect 10 Mewtwo across two sets with a (then) unknown pullrate since the era was starting anew, and yet now the second instalment of the XY BREAK era (and 9th XY set overall) has landed upon us in all it's Gyarados-ly glory. Anger of the Broken Heavens came at us with 89 cards all up with SR and UR prints, including Gyarados and M GyaradosEX, EspeonEX, DarkraiEX, along with Scizor and M ScizorEX. A release alongside it gave us 4 more Mewtwo to get -- thankfully in a pre-done pack -- and a plethora of card sleeves came out in addition to a unique take on Gym Challenge's box campaign. Add in the fact this release coincided with a massive merchandise release for a very popular merch line at Pokcen and... well. Madness Weekend certainly surmises it! Max, the wonderful store-runner of Hoshiiya, kindly sent us photos of just how big a display is made at a Pokemon Centre when a new set is released in Mega Tokyo and Tokyo Bay's respective stores. You can check them all out below! Packs. Packs EVERYWHERE. Packs and sealed boxes everywhere! It's a very unique thing to see, and Pokecen goes above and beyond to show a heap of product because they have the space to do so, which just leads to cool shots like this! 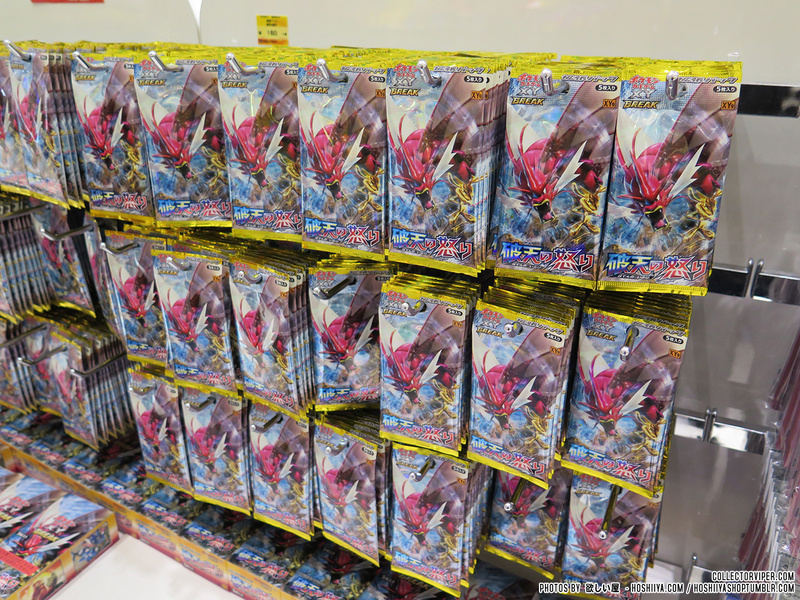 I know some of the bigger TCG and hobby stores in Japan do similar but not to this scale -- and this is something you'd just outright never see out in the west, especially all those sealed booster boxes just sitting out there to take up to the counter at will. They also had new signs up for the Poncho-Clad Pikachu promo that began being given away this weekend with purchases of TCG goods over 1,000円. Additionally, they've got advertisements up for the Pokemon Gym campaign -- instead of a promo card this time they did damage counter tins featuring two of the EX 'mons of the set. Hilariously enough none of us picked that Espeon would be one despite seeing these tins a month before it's reveal. And lastly, check out the Mewtwo Special Boxes that they released the same day -- they're currently sitting cushy with the November-released Double Mega BREAK Set blisters! They also have a massive chunk of Red Flash and Blue Shock being displayed with them. I wonder if we're seeing Unlimited release packs yet? Once again, a big thank you to Hoshiiya Shop for the wonderful photos! It's so nice being able to see how TCG releases are back in PCL's own home territory, given they're a big thing over there. 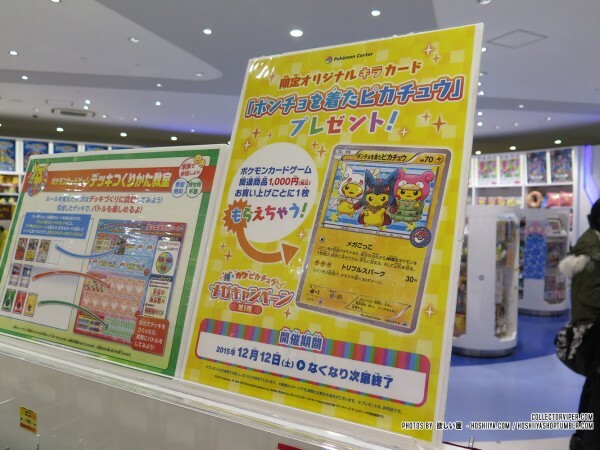 Our next major TCG set release isn't until next year, but we're going to see two big releases for filler products between now and then with the Eeveelution Battle Strength sets and the just-announced Poncho-Clad Pikachu boxes, so we'll likely see shots of those when they land. In the middle of holiday season hell. Pokemon, your timing for releases is always impeccable. WOW! 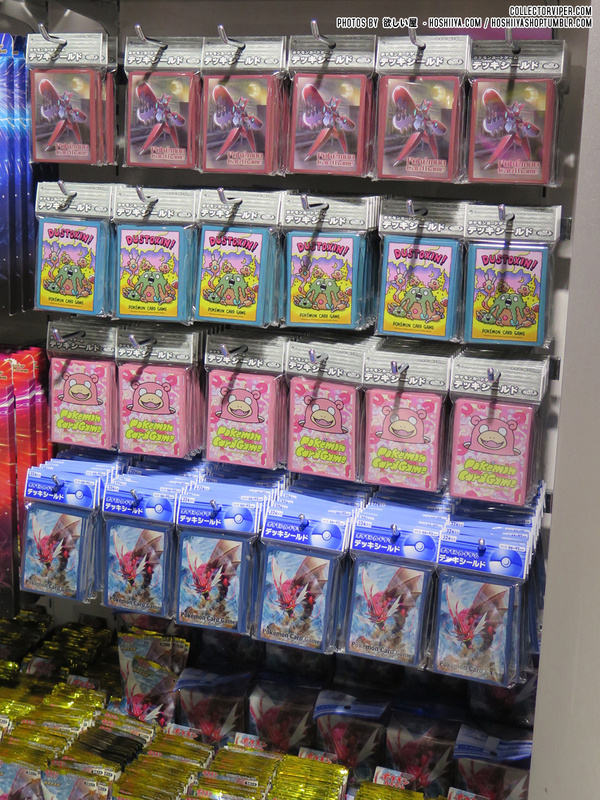 This is tcg heaven! 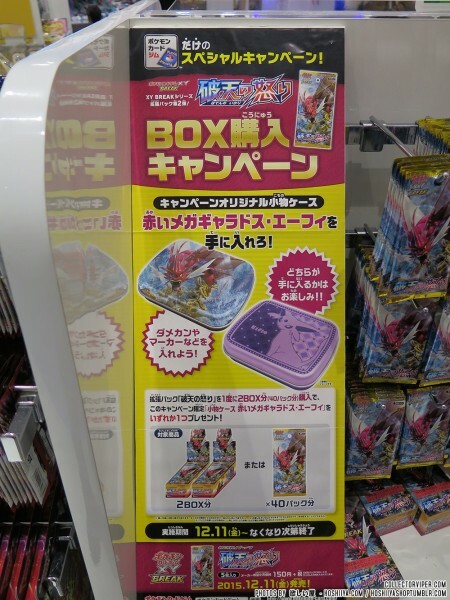 Red flash and blue shock booster packs that come with the promo packages like mAerodactylXmMawile and both mMewtwo Jumbo ones are 1st edition!